One thing no one ever tells the blissfully unaware newly engaged couple is that they are about to take on a herculean task when they finally begin to plan their wedding. 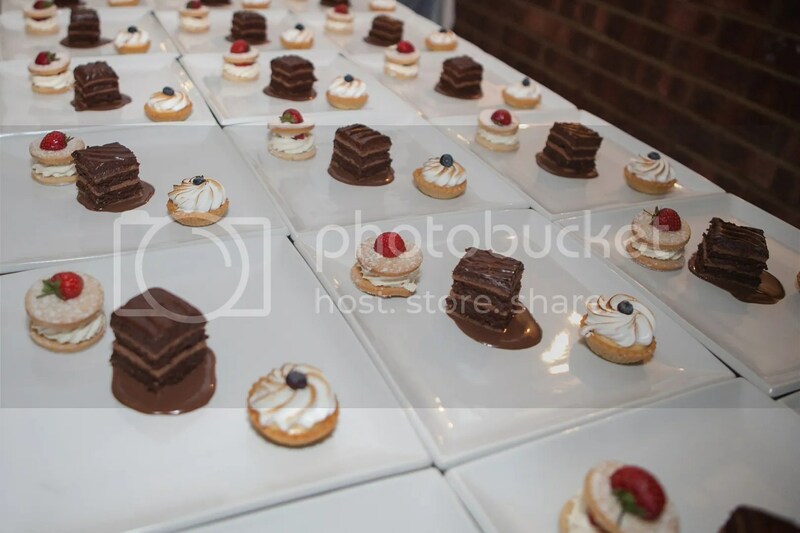 At first it seems simple, venues are amazing, details are pretty and shiny and you think that once you’ve chosen your theme that you are good to go. 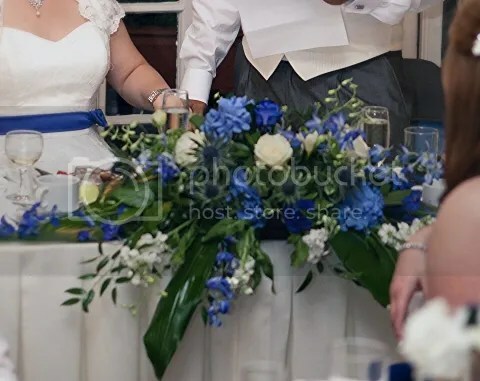 Truthfully planning is mostly fun and it is an opportunity to unleash your creativity on all of your friends and family but it can also become overwhelming as there are lots of details to think about and so many vendors to choose from. Despite it being very much worth all the work on the day you will need help to stay sane in the run up to it. 1.) Enjoy it. This is a rare moment in life where you can do anything you want your way. 2.) If it stops being fun take a break and come back to it later or it will drive you crazy. 3.) Try not to get carried away buying pretty shiny things that you don’t really need. 4.) 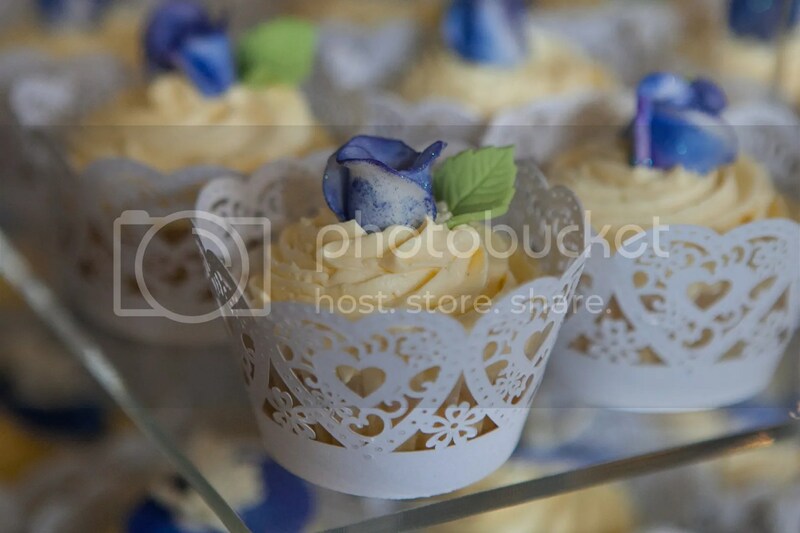 Go to local wedding fairs with your bridesmaids or groom to find vendors. 5.) The internet is your friend for bargains, especially for decorations. 6.) If you’re good at crafts (I’m not) go for it but ensure you have time to do it. 7.) 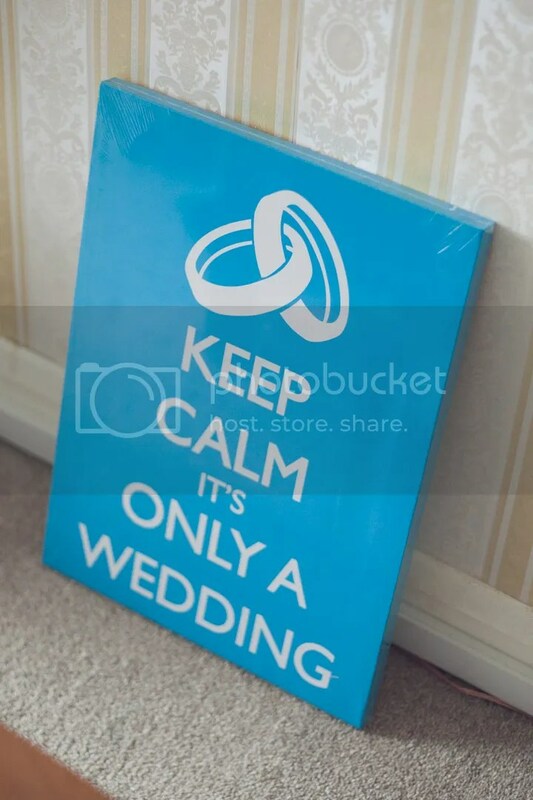 Buy realistic wedding magazines like Wedding Ideas for great tips and timelines. 8.) 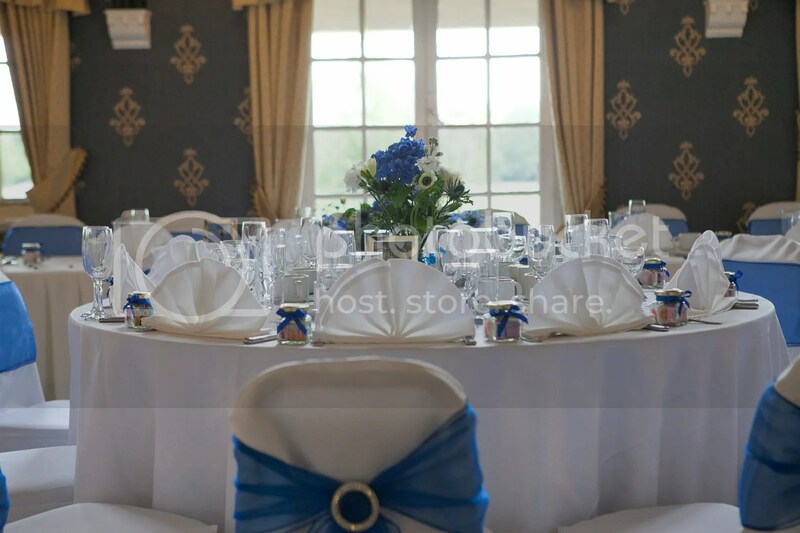 Choose and secure your venue as early as possible. 9.) Ensure that you finalize any necessary legal paperwork well within time. 10.) Keep a schedule of payments made and to make in order to keep on top of budget. 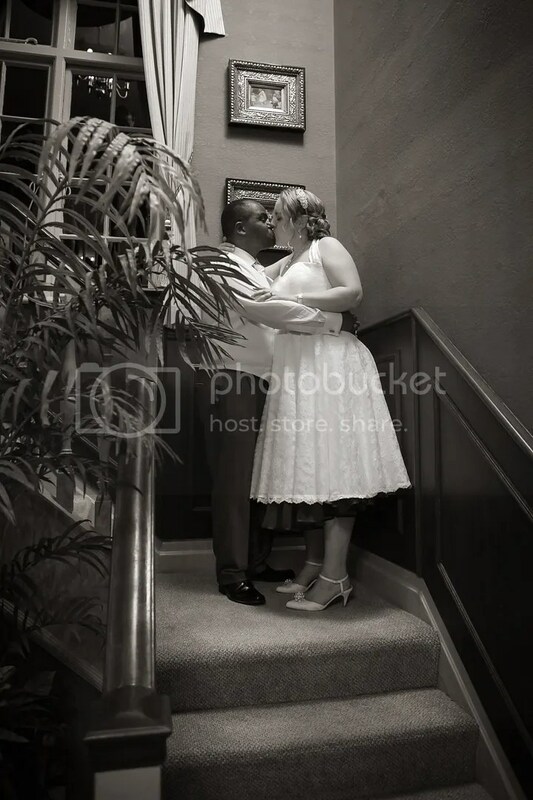 The first two things that we did when planning our wedding were booking our venue and registering our intention to marry with our local council. 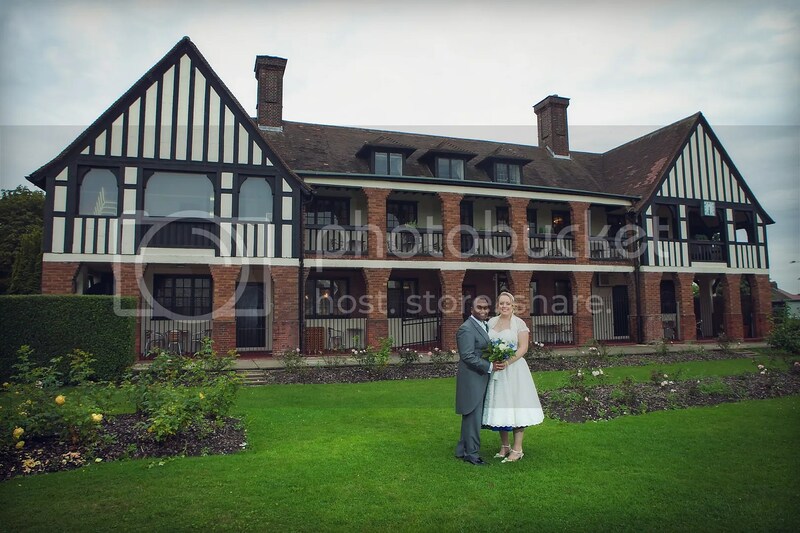 Our venue was The Cavendish Country House in Eastcote, Middlesex. 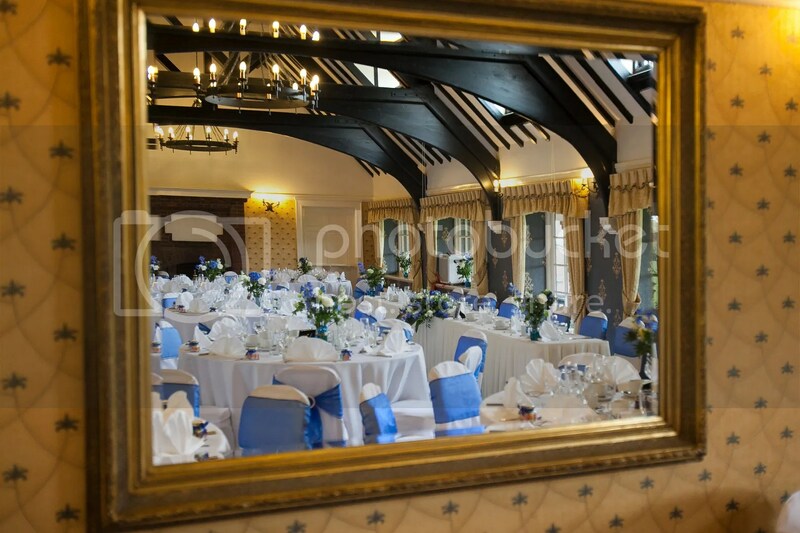 We chose it because we loved the Tudor style architecture, its proximity to public transport near to where we live, the fact that whole house is privately yours for the day, the friendliness of the family and staff that run it and the amazing selection of food on their catering menu. Food was always going to be high on our agenda because my husband’s parents are originally from the Caribbean island of Grenada and have very particular tastes. Not many venues in our local area carry any Caribbean food on their menus so, once we saw jerk chicken with rice and peas as an option in the catering brochure, the deal was sealed. 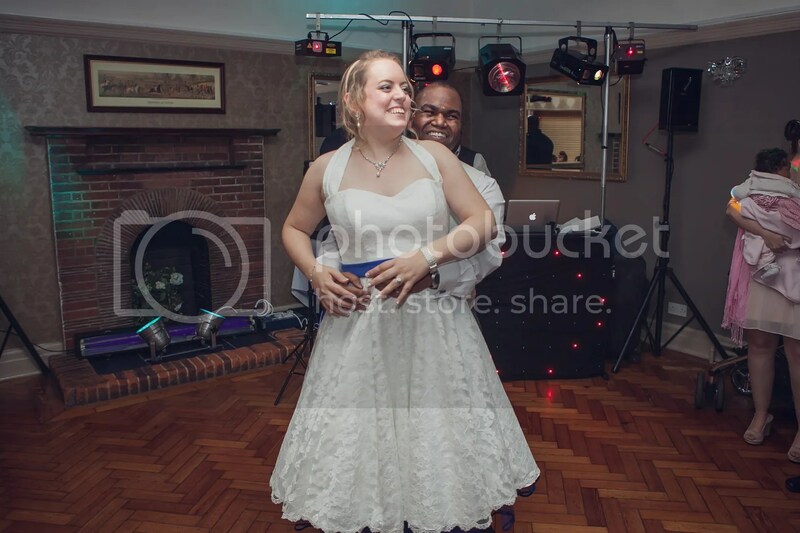 We signed up for one of their wedding packages which included drinks for arrival and for the wedding breakfast, canapés for after the ceremony, main meals of jerk chicken and lamb cacciatore and mini puddings. Also included in the package were the services of their in-house DJ John Bell from G.P. 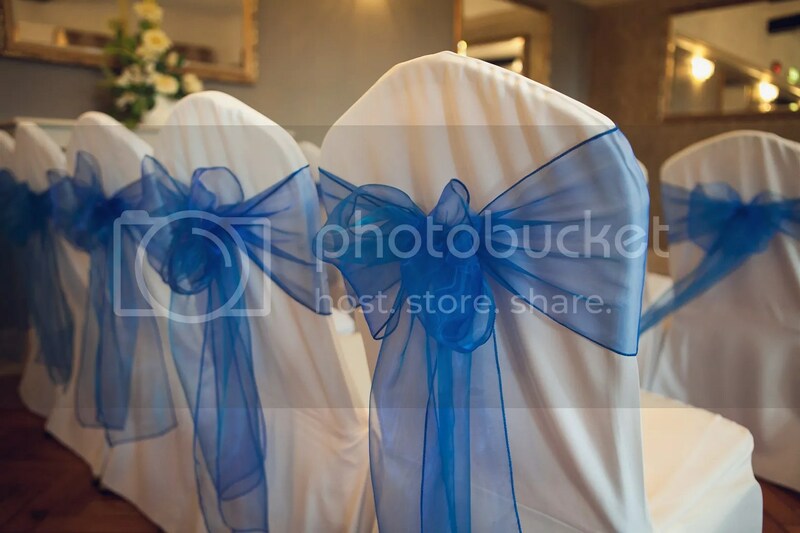 Discotheques who catered excellently to the extremely varied tastes of our family and guests (Soca, 90’s New Jack Swing, R&B and Cheesy Pop Music) and some lovely chair covers and bows for the ceremony and reception from Julie at Cupid Chair Covers. 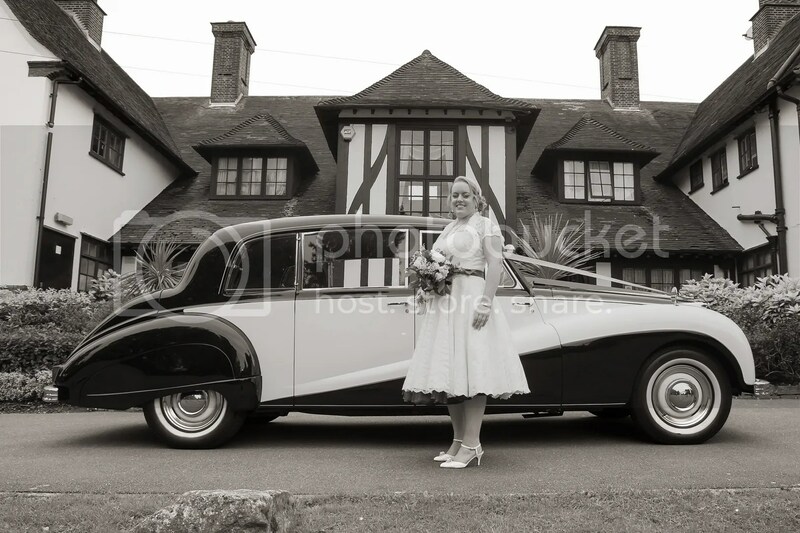 We also attended a couple of the venue’s hosted wedding fairs where we also found our wonderful photographer Louie Donovan, Classic Wedding Cars who provided of the beautiful 1956 Siddley Limousine that brought us to our wedding and brilliant cake makers Heriot Catering. 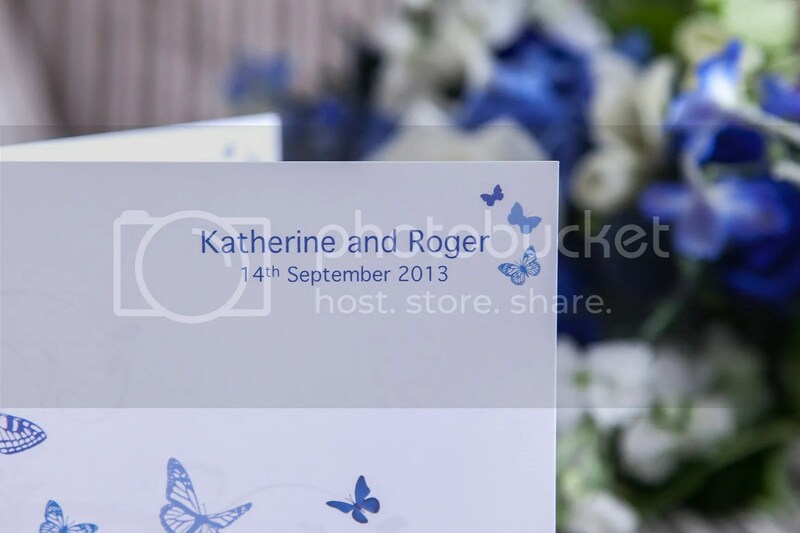 As for a theme, this didn’t really fall into place for us until we ordered our wedding stationery. We knew that we wanted something a bit 1950’s retro with blue in it somewhere but that was as defined as we got until we discovered the butterfly themed stationery by the ever helpful and patient Jen at The Pattern Boutique. 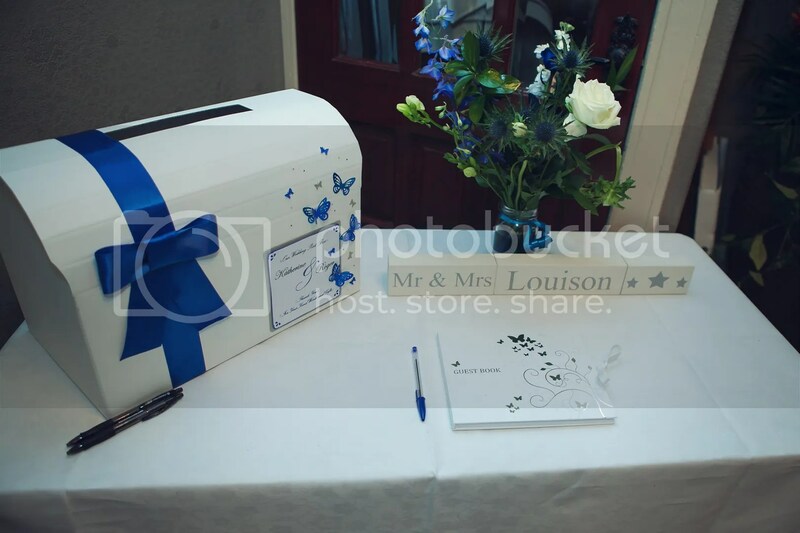 It was perfect for us as not only because it fit the colour scheme and butterflies are beautiful but the butterfly is also a symbol for those of us, like myself, who fight daily against from Thyroid disease. 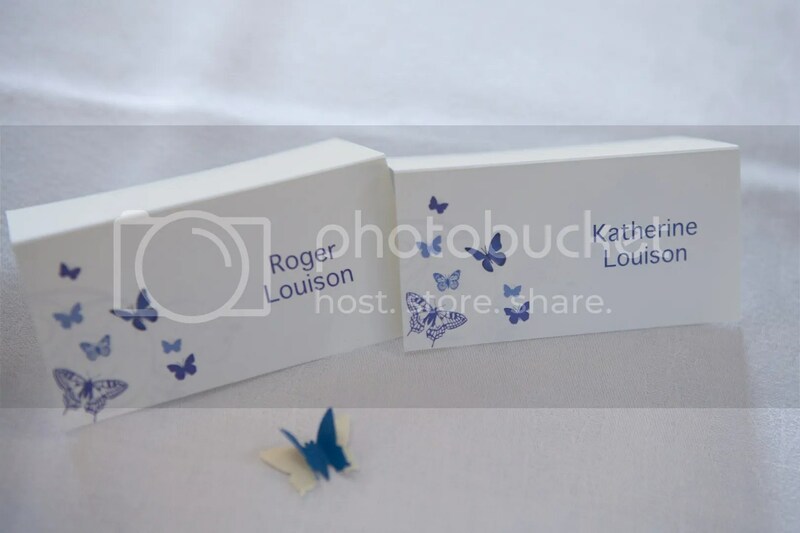 So despite my head bridesmaid having a fear of the real thing, butterflies it was for the theme. I stopped short of releasing real ones at the wedding as I did not want my lovely friend to have a heart attack. To match the now defined theme I commissioned a handmade wedding post box from Lisa Bowerbank at BeSparkled and we really loved the outcome. So much so that we are using it for our keepsakes from the wedding now. 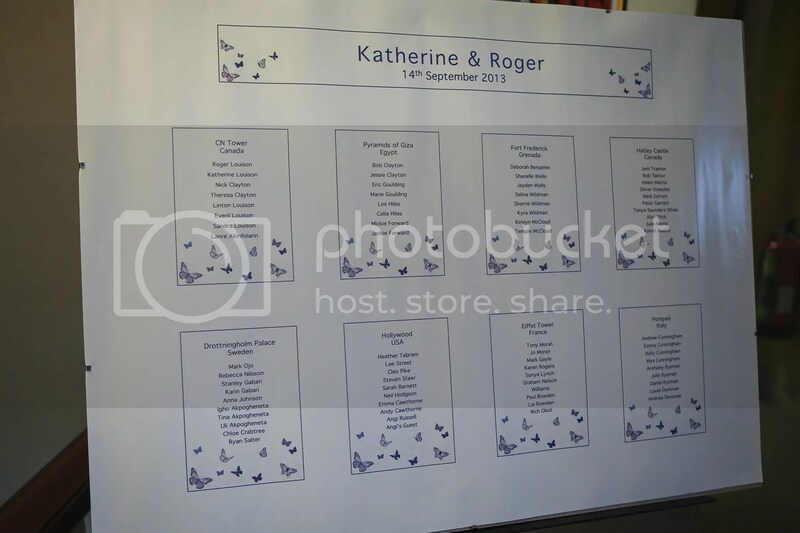 We also ordered a butterfly covered guest book and shaped trivia cards from Confetti as well as the wooden blocks with our name painted on them and some 3D butterfly table confetti from Not on The Highstreet. 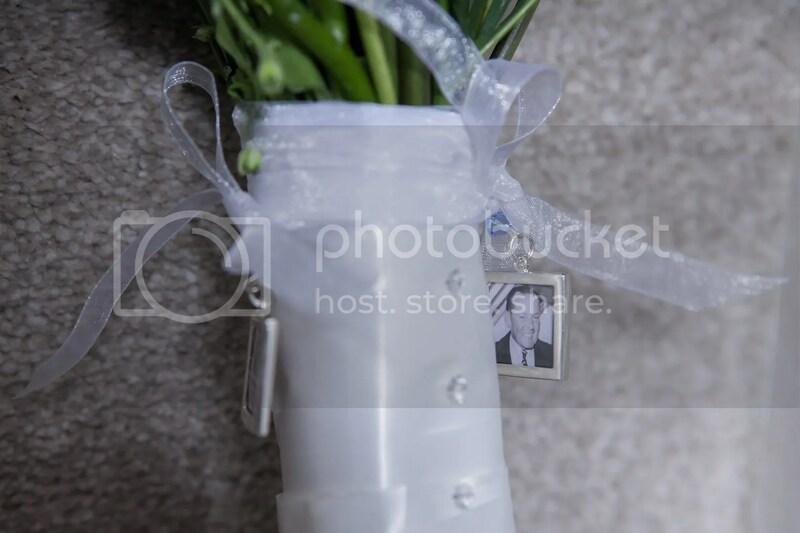 To add to the fun at the wedding breakfast and reception I also bought some vintage styled camera’s from Party Packs. However most of our guests forgot to use the flash so the quality of the photos from them was not that great sadly. 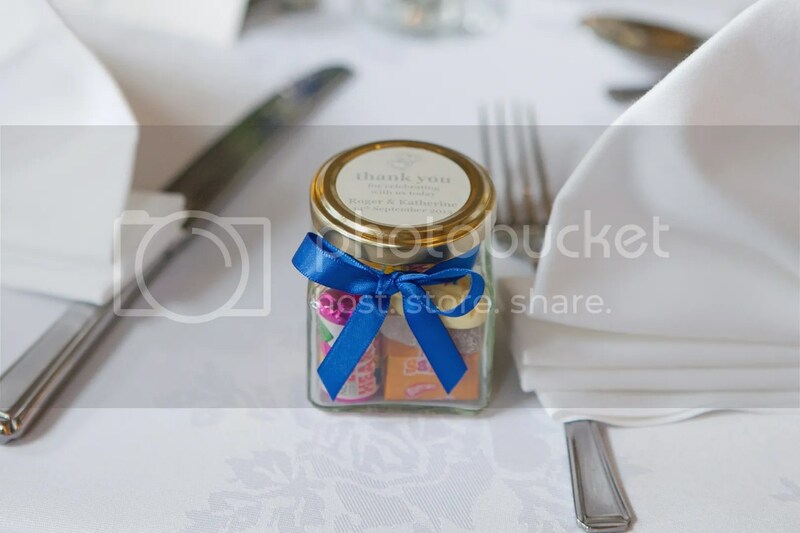 For favours, after searching wedding magazines for unique ideas, we finally settled upon some personalised jars of retro sweets tied with a blue ribbon from The Sweetie Jar. These were a storming success and probably one of the most photographed bits of decor on the day. 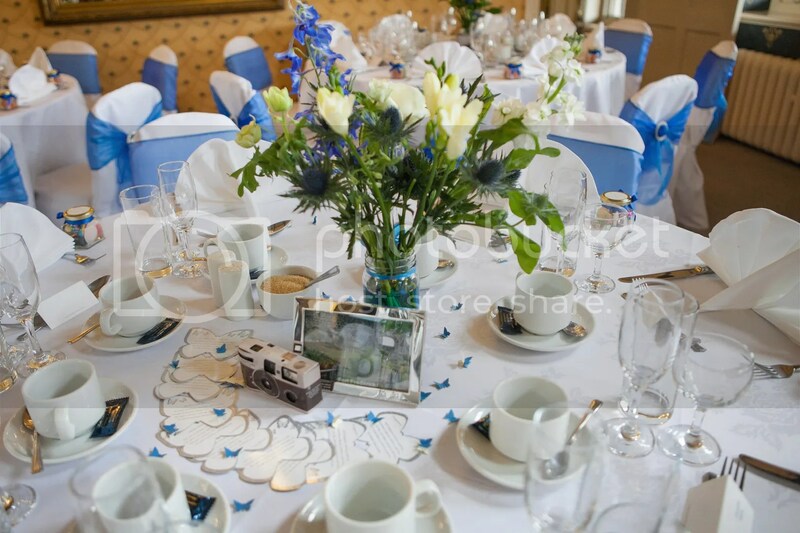 Our tables were planned around world landmarks that we have visited during our time together. 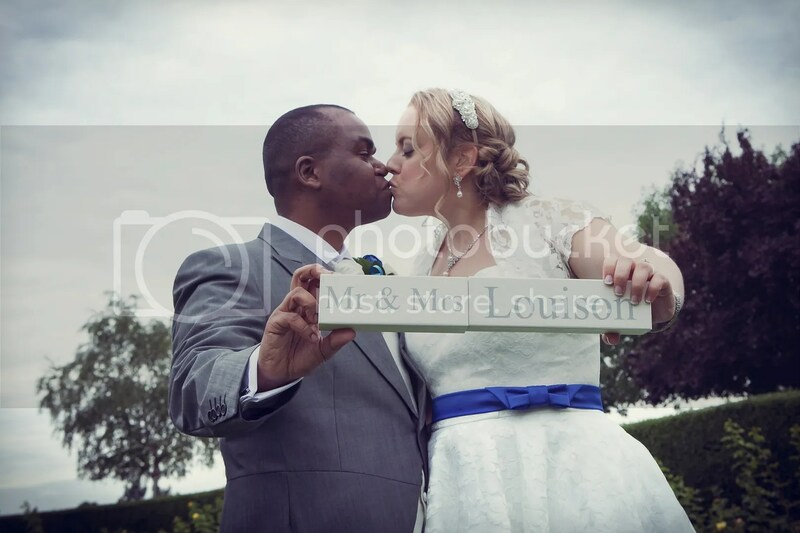 Because of this I used photographs that we took of each landmark as the table numbers and put them in some silver photo frames from Wilkinson’s. Two of the landmarks also had meaning for the guests that were seated at those tables. 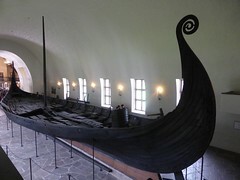 We deliberately placed my husband’s Grenadian family on the Fort Frederick table and we placed our friends from Sweden on the Drottningholm Palace table. This brought a few smiles from them all. One of the last big purchases that we made was the flowers. Despite the fact that I come from a family with quite green fingers, I do not seem to have inherited that gene and my husband doesn’t have an interest in it either. Because of this we were both a bit clueless. I assembled a few magazine cuttings of flowers I liked the look of and took them to local florist Susan at Floral Art in South Harrow, who had been recommended to us by a friend. 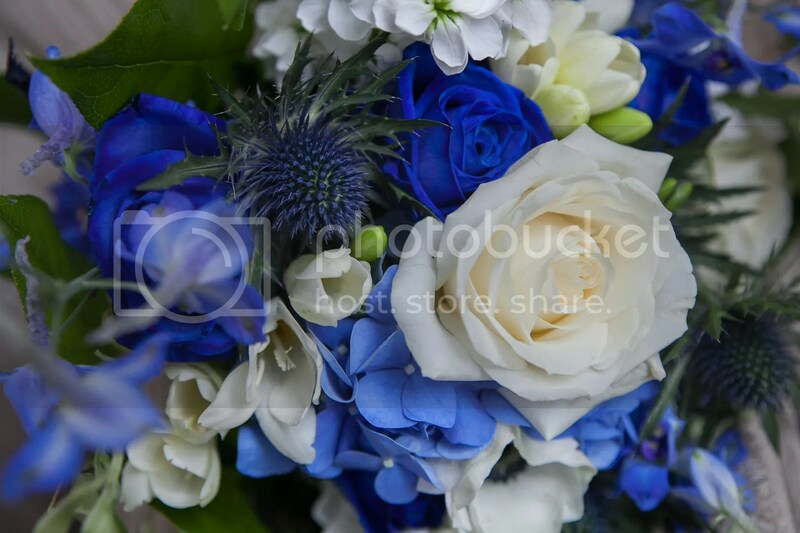 She talked us through our needs and eventually guided us to choose our bouquets and table flowers. 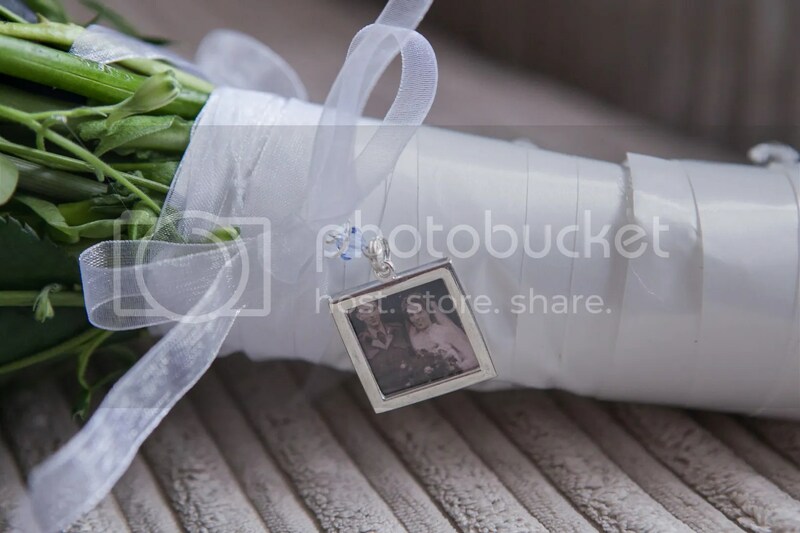 I absolutely loved my bouquet which had some picture charms, from Charm Supplies, of my late grandparents tied to it and I also appreciated the little touches Susan applied to the centerpieces which we kept simple with cut flowers in a jar. She tied blue ribbons around the jars and finished them off with some coloured water which worked really well. As you can see it takes a lot of people and a lot of time to make a great wedding. 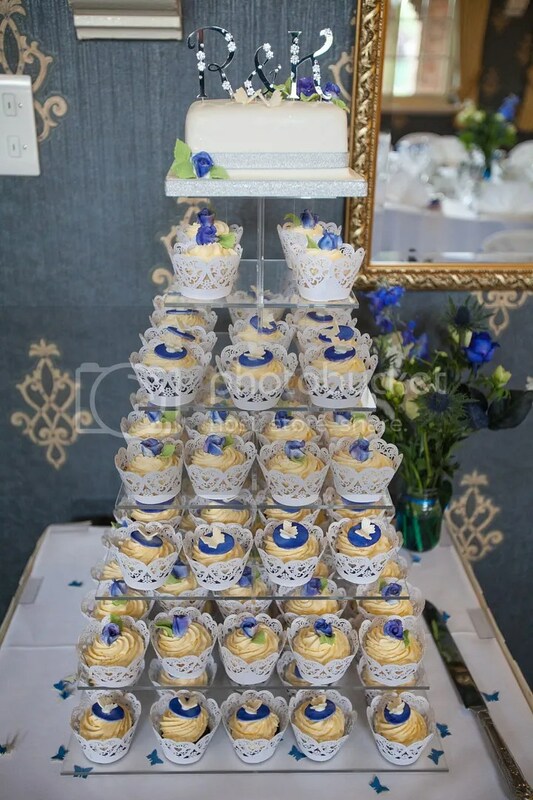 Ours truly was fantastic but it would not have been so without the care and attention given to us by our vendors. I feel I have to make a special second mention of The Cavendish’s management team and staff including both Richard Arens, senior and junior, and Gina Ford. Without their care, attention and professionalism we would not have enjoyed it half as much. Both ourselves and our guests were well looked after and nothing was too much trouble. I very much appreciated the fact that they always made sure that my aunt, who has trouble walking, always had somewhere to sit and that the DJ, John Bell, gave us such a fantastic reception where the dancing continued to the very end. Weddings are a lot of work, make no mistake. But if you pick your vendors carefully they can be a very magical experience. Ours was and I plan to proudly keep reliving it for a while yet.